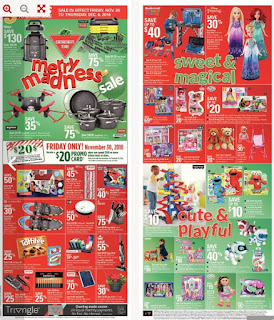 See the latest Canadian Tire Flyer 3 Weeks To Christmas. 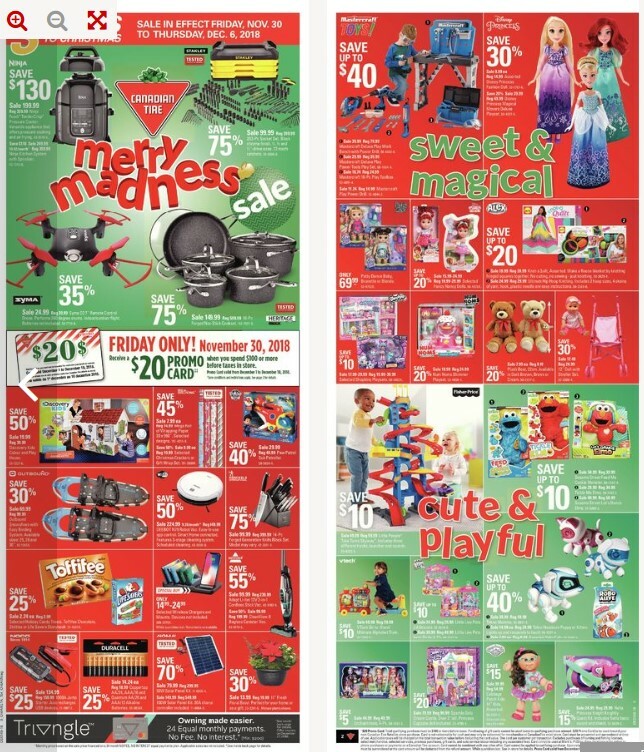 Canadian Tire weekly flyer previews! Get ready for the Canadian Tire sales! Ninja Foodi Tender Crisp Pressure Cooker #:43-9570-6 $329.99 Regular Price $199.99 Sale Price $130.00 Savings Versatile appliance that offers pressure cooking and air frying. Heritage the Rock 10-Pc Forged Non-Stick Cookset #:142-7071-0 $599.99 Regular Price $149.99 Sale Price 75% Savings Tested for life in Canada. Stanley 203-Pc Socket Set #:58-9666-6 $399.99 Regular Price $99.99 Sale Price 75% Savings Black chrome finish. 1/4, 3/8 and 1/2" -drive sizes, 72-tooth ratchets. Tested for life in Canada. Discovery Kids Colour and Play House #:50-7237-6 $39.99 Regular Price $19.99 Sale Price 50% Savings Features doors, windows, and a chimney like a real house! For Living Mega Roll of Wrapping Paper #:151-4315-8 $14.99 Regular Price $7.99 Sale Price 45% Savings 30 x 960". Selected designs. Tested for life in Canada. Outbound Snowshoes with Easy Binding System #:82-1065X $99.99 Regular Price $69.99 Sale Price 30% Savings Available sizes. 25, 28 and 30". Wireless Chargers and Mounts #:399-3579X $14.99-$24.99 Sale Price Selected. Devices not included. While quantities last. Rainchecks unavilable. Duracell Coopertop AA/24, AAA/16 and Quantum AA/20 and Alkaline Batteries #:65-0024X $18.99 Regular Price $14.24 Sale Price 25% Savings Long-lasting power for remotes, flashlights, toys and more. Foodsaver V4825 Automatic Vacuum Sealer Model #: 43-0650-0 $269.99 Regular Price $189.99 Sale Price 25% Savings Tested for life in Canada. Black + Decker Kitchen Tools 6-Slice Convection Toaster Oven Model #: 43-2222-8 $199.99 Regular Price $99.99 Sale Price Up to 50% Savings Tested for life in Canada. Sodastream Fizzi One-Touch Machine Model #: 43-1019-0 $179.99 Sale Price Colours may vary. Sodastream Flavour Mixes Model #: 53-2179-8 $6.99 Sale Price Selected. Keurig Coffee Systems Model #: 43-1011X $89.99-$169.99 Sale Price Selected. Cuisinart 12-Cup Coffeemaker Model #: 43-9573-0 $99.99 Regular Price $79.99 Sale Price Up to 40% Savings Brew pause feature, pour cup before brew cycle ends. Self-clean function. Programmable 24 hour brewing timer. Black + Decker 10-Cup Food Processor Model #: 43-1376-8 $79.99 Regular Price $59.99 Sale Price 25% Savings Stainless steel chopping S-blade.